Fast and Easy - Wise Disk Cleaner utilizes a new advanced algorithm as well. It takes just a few seconds to scan your whole disk. What's more, Wise Disk Cleaner is very easy to operate for both novices and pros (for whom command line is provided). Common Cleaner - It cleans temporary files, download history, browsing history, form history, invalid shortcuts, traces, cache, cookies, passwords, Windows components and many other useless files. Advanced Cleaner - You can search the files you want to delete by their specific extensions. For advanced users only. Slimming System - It deletes Windows' own items that you don’t need any longer, such as sample pictures, sample music, sample videos, IME files, help files, download installation files, installer baseline cache and so on. Automatic Update - Automatic update is activated, it can download the update file and install it automatically. User don't bother to download the installer file from the webpage and then install it manually anymore. 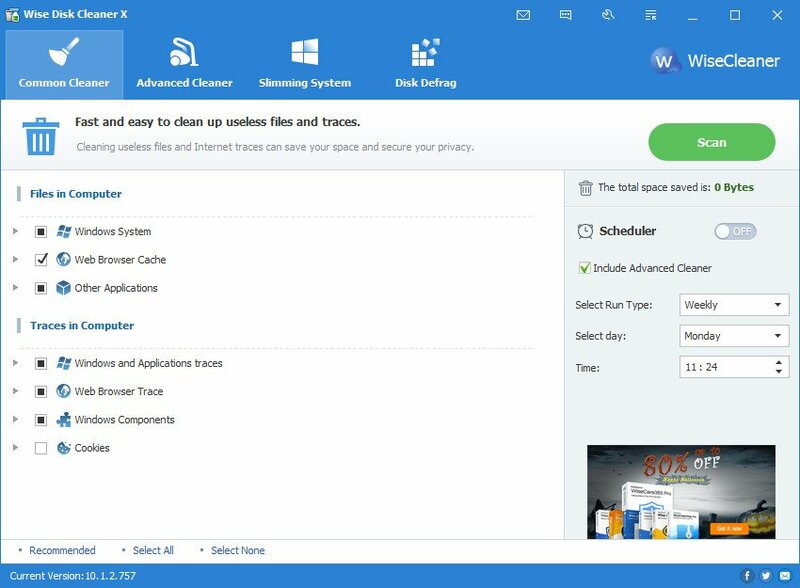 Custom cleaning rule - Wise Disk 8 added support for User Custom Cleaning, allowing users to customize the options in it as an advanced user, which is more suitable for advanced users.